Wastewater from restaurants, hotels, and commercial food service facilities have fast flow volumes and high water temperatures during peak dishwashing and utensil cleaning periods. Issues occur when fats, oil and grease (FOG) liquefy at high water temperatures used to wash dishes and kitchen utensils. When the wastewater cools the FOG solidifies in the sanitary sewer or septic system. Conventional grease traps were made to prevent grease from entering the sanitary sewer or septic tank. High grease loads, emulsified grease, and fast flowing wastewater from automatic dishwashers cause FOG to bypass the conventional grease trap and enter the drain. Generally conventional grease traps do not work as anticipated. High levels of fats, oil, grease (FOG) and food solids cause are responsible for high biological oxygen demand (BOD) reading. FOG causes problems for septic systems and sanitary sewer systems. Biological Oxygen Demand (BOD) is a measurement relating to the amount of oxygen in water to support aquatic life. Waste water with organic materials (food solids, restaurant grease) serves as food for aquatic micro-organisms. The micro-organisms feed on organic materials. Micro-organisms multiply consuming increasing oxygen quantities. 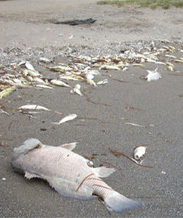 When oxygen levels in water drop, fish and other aquatic life will not survive. Eliminating restaurant grease from the sewer will vastly improve the BOD levels of our lakes, streams, and rivers. The City of Toronto is testing for BOD levels and fining restaurants accordingly. Are your grease traps performing to compliance? Total Suspended Solids (TSS) are solid organic and inorganic materials that hang below the water surface. Suspended solids, in layman's terms, is similiar to stirring up the sand near the shore of a lake. The water turns cloudy from the suspended solids. Total suspended solids must be coarse enough to be trapped by a coffee filter. The materials include natural, industrial, and commercial wastes. 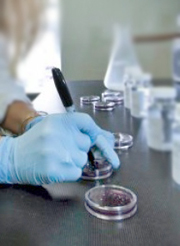 In a restaurant or commercial kitchen facilities, food solids as well as fat, oil, and grease heavily contribute to TSS counts. Food Solids accumulate in conventional grease trap devices. Food solids bypass unmaintained conventional grease traps. Suspended solids absorb heat from sunlight, which increases water temperature and decreases levels of oxygen (cooler water holds more oxygen than warmer water). Since aquatic plants receive less light, photosynthesis decreases and less oxygen is produced. The combination of warmer water, less light and less oxygen makes it impossible for aquatic life to live. 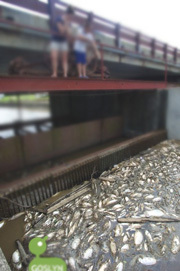 Suspended solids affect marine life in many ways. They clog fish gills, reduce growth rates, decrease disease immunity, and taint egg and larval development. Food Particles that settle on lake and river beds smother fish and insect eggs. Hatched larvae suffocate. Food Solids that settle in the spaces between rocks destroy the habitat of bottom living life. Is your Grease Trap Compliant?